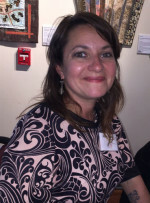 At the seventh annual Nâzım Hikmet Poetry Festival, Andrea Young X’91 was selected as one of seven winners of the poetry competition associated with the festival. Young was selected out of 337 submissions as reviewed by a five-person panel. Congratulations! You can read more about the poetry prize at the Nâzım Hikmet website. The website states the winning poetry will be published in the festival book and on the website, so check there soon.